Adding a twist to crunches will tighten your oblique muscles. If your midsection is on your priority list for reducing and shaping, you've probably been told that a waist twist workout, or at least adding waist twist exercises to your routine, will slim your waist. While it's true that there are plenty of exercises you can do that incorporate a twist in the middle, you should be aware of what these moves really do for you -- and what they won't do. You can feel the stretch in your oblique muscles as you hold a broomstick across your shoulders and twist from side to side. Your obliques are the muscle group that is being targeted when you perform any movement with a twist. You'll tighten up your obliques when you add a little twist to your workout as well as improve flexibility in your waist and hips. In "The Chinese Way to Healing" Misha Ruth Cohen and Kalia Doner reveal that movements that require you to twist at the waist will also massage the internal organs. Many times, waist twist exercises are performed with spot reduction in mind. Personal trainer Matt Siaperas reveals that he is always sure to tell his clients that although waist twists will work on toning the obliques, they won't trim the waistline at all. Losing weight in one concentrated area isn't possible. If you want to tighten your oblique muscles, definitely include waist twists in your workout. 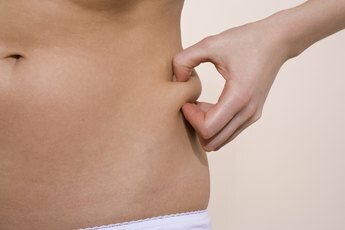 But if you want to lose weight around your midsection, aerobic exercise is the only thing that will burn the spare padding off of your middle. If you want to add a few oblique-working exercises to your workout, you have plenty to choose from. Do the same handful each day you work abs or rotate them and perform one or two different ones each time. In addition to the basic broom stick twist most people are familiar with, you can do a twisting crunch or situp, a twisting trunk row, a plank twist done using a stability ball or standing medicine ball oblique twists. When you perform a waist twist, your back plays a part, too. Siaperas watches clients carefully as they twisting exercises to make sure they don't push their spines past the three or four degrees of natural rotation. Twisting too far can put undue stress on the lumbar, causing injury or exacerbating one that already exists. Rather than letting them push themselves too far too fast, Siaperas shows them how to safely increase their rotation threshold by progressing in extremely small amounts and over an extended period of time. Determining the amount and how quickly depends on the individual, their fitness goals and any physical limitations they may have.